Hello everyone,this is our first recommend item in today. The Kindbright Sherman RDA Clone is constructed from 316 stainless steel in 28mm diameter. It comes with a two-post clamp style build deck and redirected bottom airflow. The RDA is designed for large coils. There is a wide build deck with two large clamp style posts and redirected airflow channels that are raised above the juice well for enhanced flavor production. 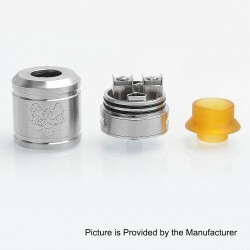 The RDA features an adjustable bottom airflow control ring and comes with a wide bore 810 drip tip. 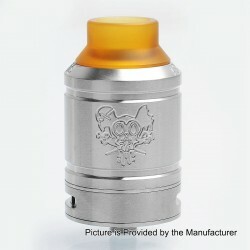 This RDA comes with bottom feeder pin.This product has many color to choose. What do you think of it?Leave your comments below.